Are you worried about to keep clear your garden landscapes from dead leaves falls on? It must have been very difficult to clear out. If you are looking around as how to easily get rid of these without much effort, then you should buy a well-liked gardening tool called the leaf blower. It not really hard to understand what this tool is. If you would continue reading then you will find that a leaf blower is a machine that can clean up the junkie leaves you to find spread over a landscape quickly and easy. It is an all year round serving machine. It has a variety of models and features, you can find one according to your need. Choosing the right tool starts with evaluating your need. Different Types of tools are available in market differentiating with style and engine types. Main types of these machines are Electric, battery-operated and gas powered. If you will see another side which is obviously style, then there are handheld machine, backpack units and wheeled models for junk cleaning. It really is a challenge for a normal person to make a decision that which machine to buy for his or her garden. 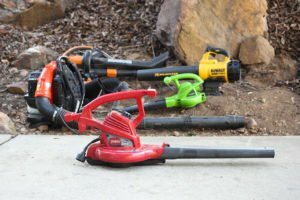 A deep look on the most popular kinds of leaf blowers is below. This machine is designed for single hand use because it is lightweight, figuring in total about 8 pounds. It can be started with a push button easily and less noisy during its working. It can be used to clear debris with in a range of 100 feet. The corded leaf blower has one problem as its name describes, it is limited in movements because of cord. If there are trees and obstacles in your garden then it can be a big problem in using it. It may cost from $30 to $100. Home gardeners are likely to be a big fan of cordless blowers because they have a small area to clean. It is obviously light weighted and easily movable unit which is way convenient then corded. But the problem is it only works for that time until the batteries are charged because it has chargeable batteries. Maximum usage capacity after full charge is limited to one hour approx. This unit is available in between $150 and $300. These units are without a cord and deliver a decent amount of power, so they have been considered as the good option in blowers. These units are a little bit noisy but offer a handsome power and consequently, debris cleaning will finish quickly. To start these engines one has to pull the cord and a regular tuning is also needed. As they are on gas so need gasoline to run and they also exhaust smoke. Most of the cordless gas models come with a two-stroke engine but there are 4-stroke engines also available in different models which are more powerful. Weight can also be different as 2-stroke is less and 4-stroke will have more. You would be investing $90 to $220 on these machines. They are in great power and easy to handle. They are also very quick in cleaning the junk from the garden. Those are very easy to carry but weight could be around 17 pounds. You can carry them on your back and shoulders with the convenience of use. As the engine power goes up, ultimately engine noise will rise and it can also pollute air while performing the duty. It only is started on gas and oil and will keep it running. Cost range is in between of $160 to $480. If you are looking to clean up a large area of the garden, then the wise option is to buy a gas leaf blower with wheels. A good gesture of this is that it works with the mixture of fuel. A 100-pound machine can be considered as weighted and it is also noisy. You have to spend a bit heavy amount on buying it because of it can be used for commercial purpose. Its price ranges are $300 to $800. Things to be considered before buying a Gas leaf blower. These machines are the best option if you would compare with any other blower. It offers maximum power and portability. As they are the most liked tools to clean up the landscape. This will definitely get the job done but these are the loudest. So if you have noise ordinance from your neighborhood than you need to think before purchasing. These tools also require regular maintenance, depends on the tool. 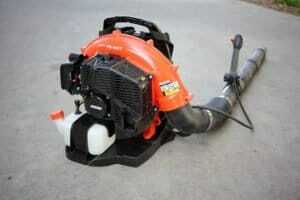 Gas leaf blowers deliver maximum mobility and run time. Depends upon the model but these are well suited for comparatively large areas for frequent or prolonged use. Some of them start with pull cord but some models start with an optional, powered device which has to be purchased separately, excluding the need to use the pull cord. Gas blowers need the right fuel, so follow the manufacturer’s requirements and read Fueling Outdoor Power Equipment for tips to keep your machines running properly. Flush the old fuel from the gas tank. Consider adding a fuel stabilizer. Carburetor and fan blades need to be cleaned. Check the fuel filter, fuel line, cables, and connections. Examination of the spark plug and replace if needed. With a little care, you can expect to get a life of about 1,000 hours of use without any repairs. Before making your mind to purchase a gas leaf blower, considering you yard certainly and the performance you expect out of leaf blower. So most important decision to make is the type of leaf blower and the right option depends on your garden’s terrain, size, and your budget. Of course, the more powerful will be the noisier. Do check the decibel rating before buying because some regions have restrictions on noise. Make sure you check the regulations in your town, do consider getting one with a noise quelled. 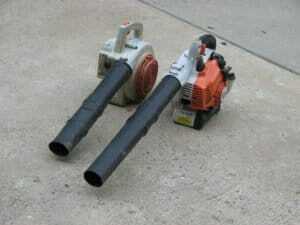 Being an owner of the small garden, always check is gas leaf blower is comfortable to hold. Also, go through that if it has speed settings which is a useful feature. This allows you to change the output according to the job. Always keep in mind the cost factor because if you have a large garden, it worth spending more on a more powerful gas leaf blower. Upfront cost will definitely be higher, but the extra power will save your time and frustration. Make sure you buy some ear protection too!